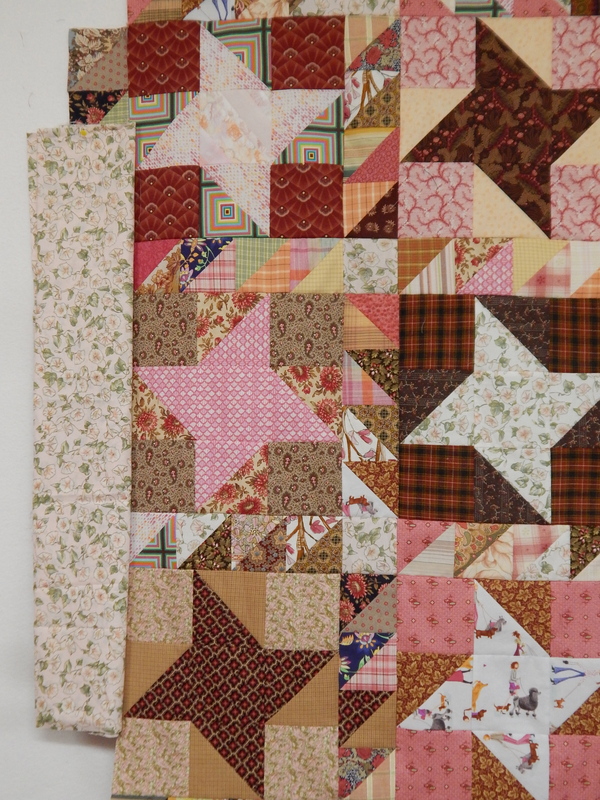 I decided to get back to work on the big churn dash quilt. And let me say right here–if you are looking for someone to learn about traditional piecing from–ITS NOT ME. As much as I tried to do everything so carefully, I sometimes had a hard time fitting things together! I read and re-read the instructions in the magazine. Oh, hmm. This is a KING SIZED quilt! Definitely the largest quilt I have ever made. So I would say that a quilt this big is not ideal for my method of putting a quilt sandwich together (steaming the layers and then pinning.) 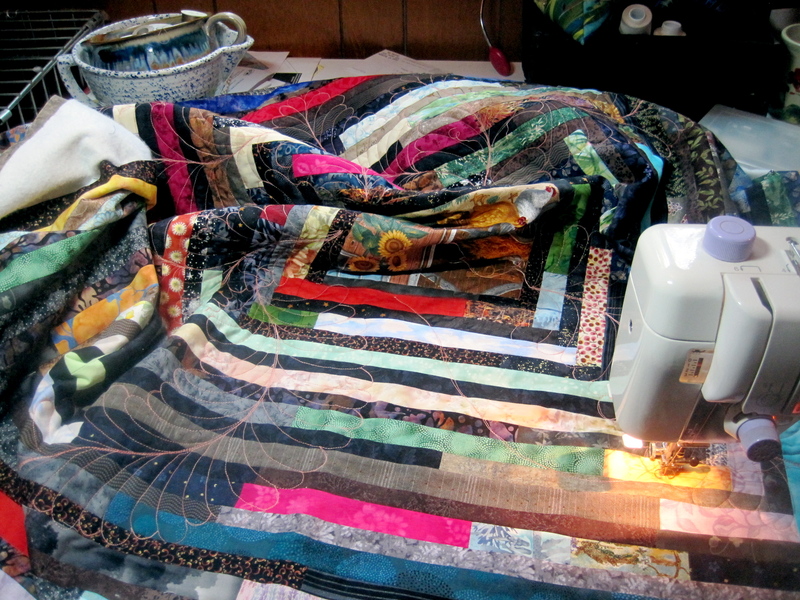 But here I am documenting the final corner of the quilt sandwich being put together. You can see that I carefully folded the quilt as I finished each section. That was a good idea. 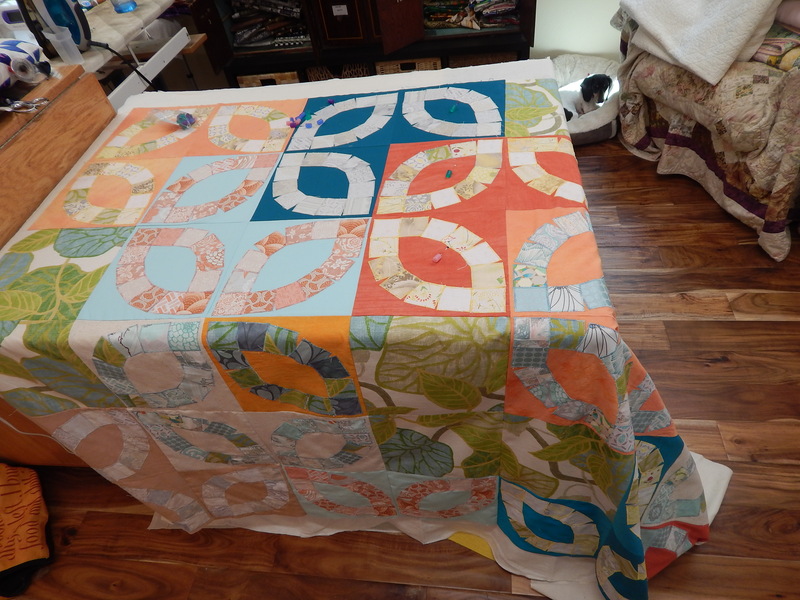 And then, since it was so carefully folded, I decided to transfer it to the quilting table just like that. That also turned out to be a good idea. 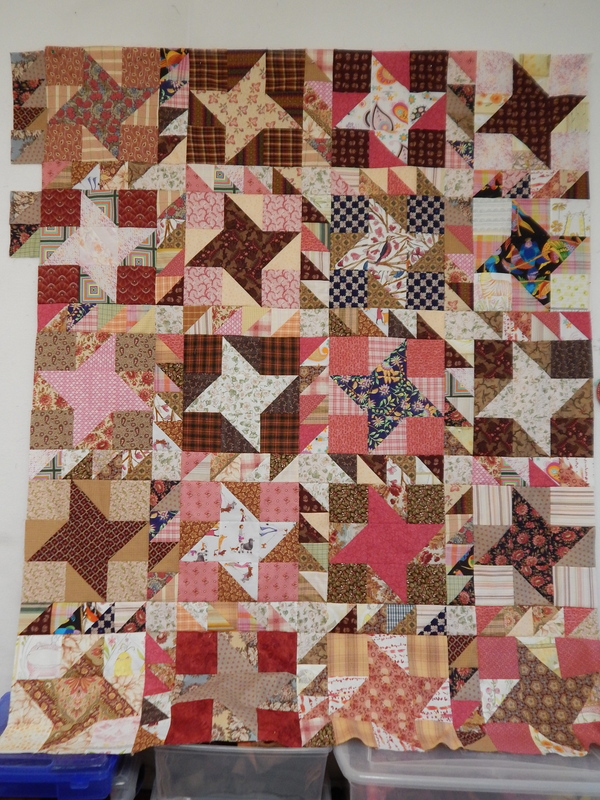 I have already quilted two out of the five rows of churn dash blocks. 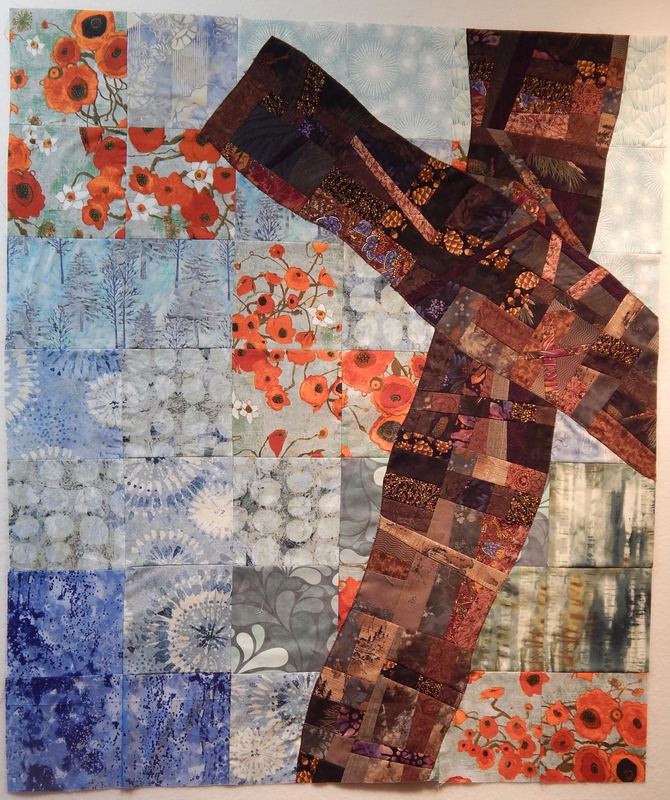 It was easier than I thought to manipulate such a large quilt. And then, re-reading the instructions, and staring at the picture over and over (remember, I wanted to make this quilt just like the one in the magazine…) I found a mug with a 3 inch opening, made a plastic circle template from that, and drew the pomegranate designs in the setting triangles. I free-hand drew the leaves as they were in the photograph. It was fun just following the lines to quilt this! I am very excited about this quilt. There will be lots of “fill” to go back and do after I get the main design done. But the quilting is moving along much faster than I expected it to! Thanks to BF, this quilt will forever be named P.I.N.K. Can you see the square with the pale blue background, and the lady walking a dachshund and a Standard Poodle? That was one of my scrub tops. I loved it because at the time, those were the two breeds of dogs that I owned! Made my sandwich, and yesterday I wanted to start quilting it. But first I had to play around with what thread to use. It just so happened that I had a bit of batting and muslin in the circular file :), and a LOT of leftover squares and half square triangles from the quilt. I tried out different weights and colors of thread. In the end, I liked my first choice, which says its color is “natural.” But it is a glazed cotton, and I don’t think that that will be very pleasant to sew with. I don’t like the tension/unevenness of the stitches. So I went with the second best, and quilted one square. This morning, I think I am going back to Joann’s or Walmart, or the Sewing Cottage to try to find “natural” in a 40 weight cotton thread. This is not the first time I have declared a moratorium on my quilting. 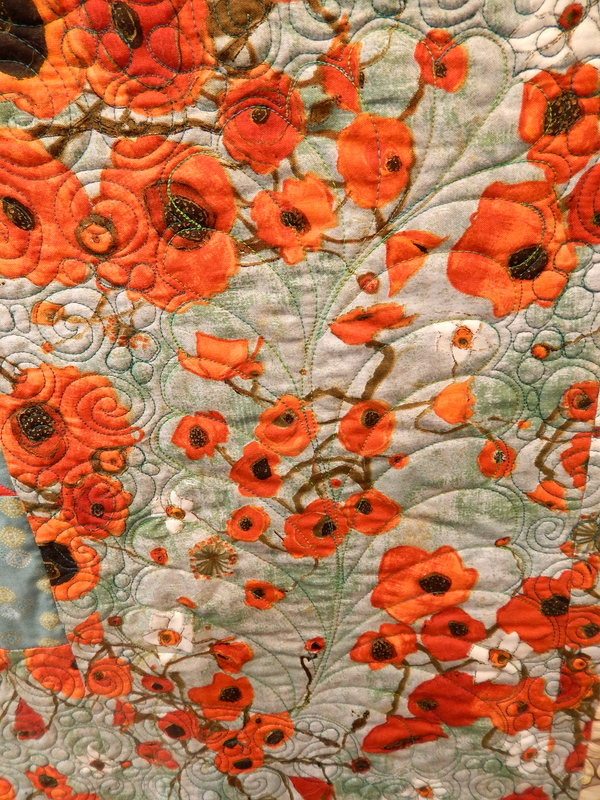 In the past, it caused me some angst–would I ever return to my quilting? Would I lose my forward momentum? How would I ever get to all the ideas I had if I kept taking breaks? Now I think that it is an excellent idea. It really frees up a lot of time, and I usually get more done than I had even planned on. In this case, it was finishing my little oriental hooked rug, and I had the added bonus of having the time to clear out my bedroom and closet, as well as the unexpected (and time-consuming) project of choosing paint and carpet colors! 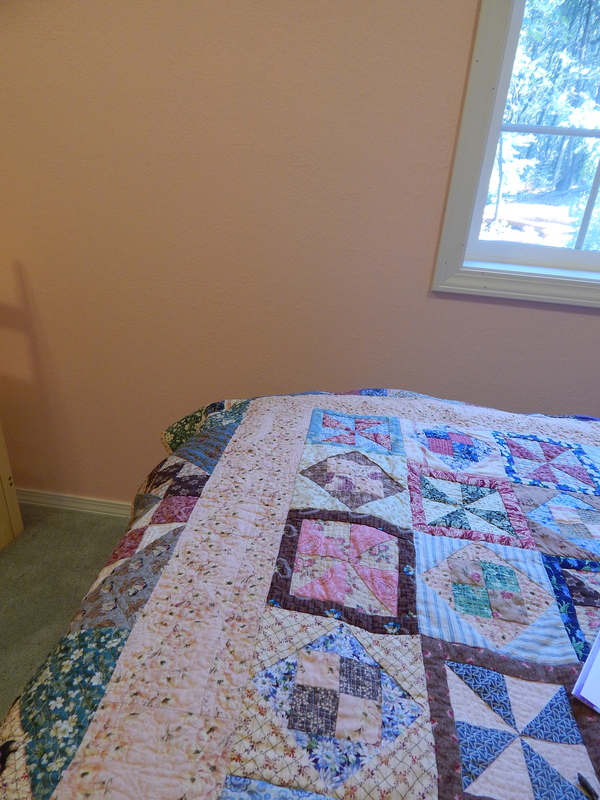 Here is a bit of the new bedroom colors, along with the quilt that is currently on my bed. 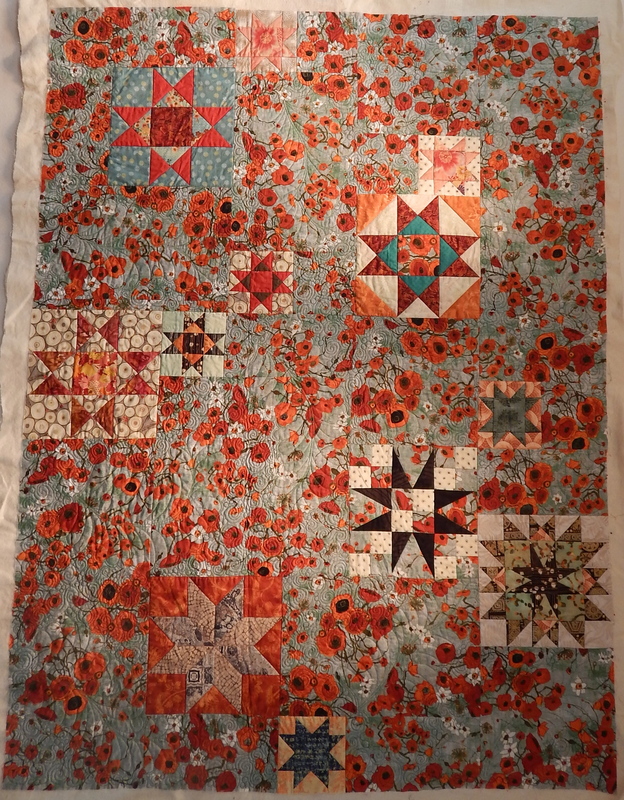 Good grief, I did not even realize until I saw this picture that the color I was trying to get for the walls was the EXACT SAME COLOR as the inner border of this quilt!! I returned from my adventures at rug hooking camp refreshed and looking forward to resuming my quilting routine. I left a lot of quilt projects unfinished, and I had a lot of new ideas I wanted to try out. Being a little bit disciplined won out, and I started working one by one on the unfinished projects. 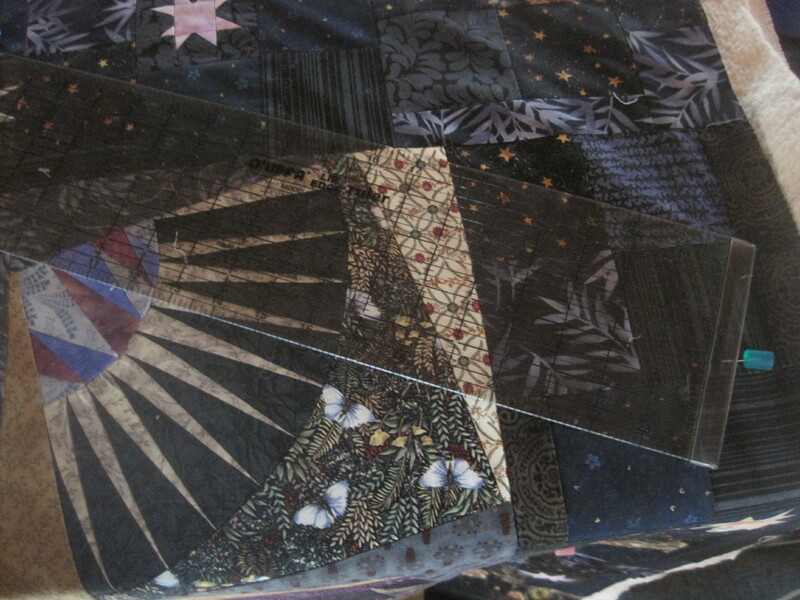 First up, I finished piecing together the dark blocks for the cross insert in this quilt. I decided to cut the cross with a wavy edge, and then decided that it would be easiest to raw edge appliqué (zig zag) this on top of the background piece. I liked the way it looked with the cross way off center. I will add words, but I’m not sure how I want to do that yet. I’ve already made the quilt sandwich and have all of the cross quilted. Then I remembered that I had this quilt in the closet, almost completed. I got it out, marked the places where I had missed the quilting, and got that done. It just needs binding to be completely completed. 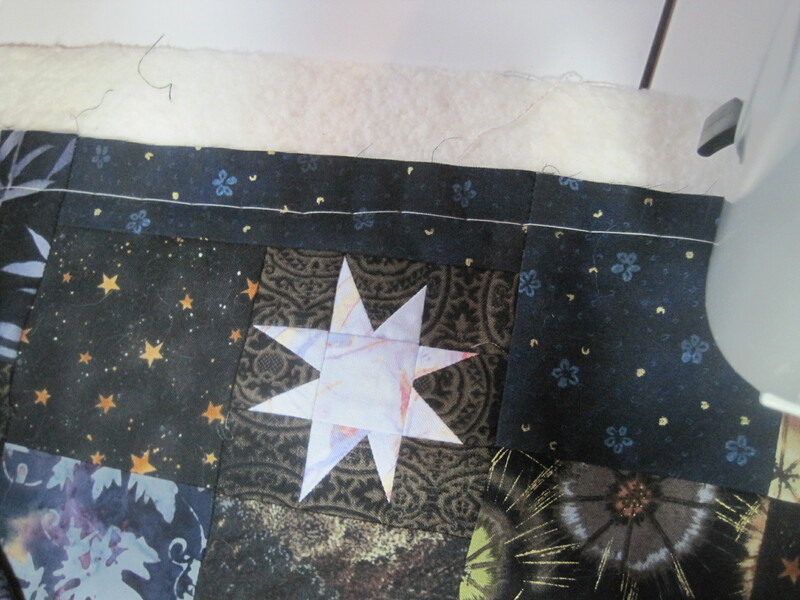 This is a quilt that I started in an Alex Anderson workshop on stars. I had this background fabric (that obviously I love,) and wanted to use it as my focus fabric. Its big enough to use on my bed. Hmmm…seems I do have a coral and aqua obsession going on here. 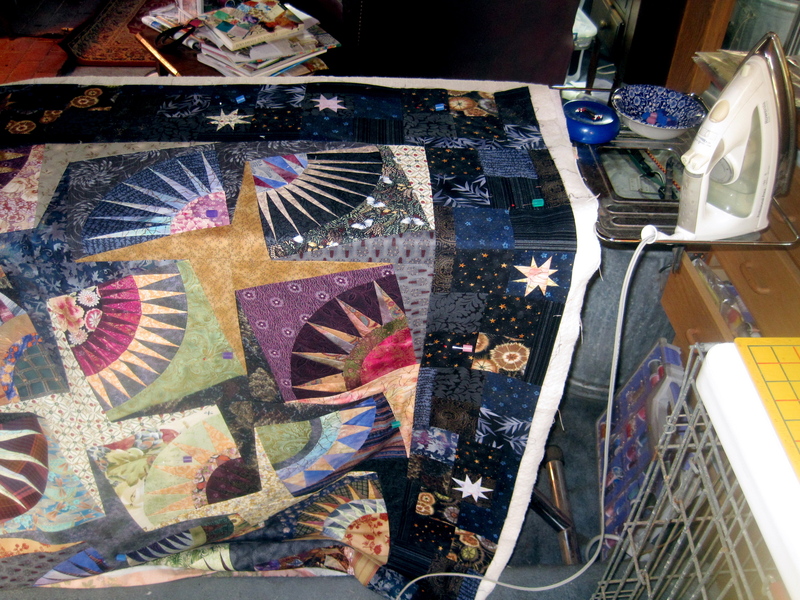 I quilted the stars “in the ditch” and then filled in the background with huge feathers surrounded by spirals and bubbles. And this next project I can hardly believe myself that I got this done. I do not like working on large quilts. I do not like making big quilt sandwiches. But once in a while I make a quilt that just insists on being big. That is the case with that double wedding ring that I was working on before the moratorium. I really do like this quilt, and so I decided that I must make the sandwich. And I have to tell you, I LOVE my big ironing surface!!! It was big enough that I could use my “steam iron method” to make this sandwich in four quarters. I took this picture to show the ruler that I slip between the ironing surface and the quilt sandwich so that I can put the pins in. When I steam the quilt top like this I do not need to put very many pins in place. I usually take the sandwich directly to the machine and either machine baste it together or stitch in the ditch between the blocks. Oh, and in the measure twice, cut once department…DON’T do the math in your head. Write all the numbers down, and probably don’t do it when you are already tired. I was VERY SURE that I had made everything plenty big. I started making the sandwich, and the backing was only an inch and a half larger than the top on two sides of the quilt. That is cutting it a little too close, even for me. It feels good to be home, good to be back working in my studio on my quilts, and very good to be back blogging about my adventures! Since I blog about food quite a bit on my other blog, some of the readers are quite intrigued with the ‘quilt sandwich’ that I keep referring to. I don’t actually like making quilt sandwiches. 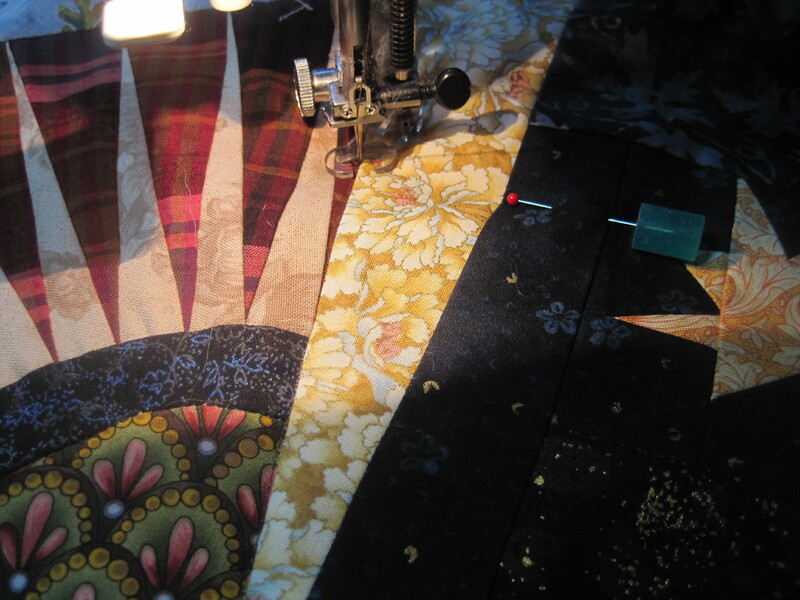 I think its the most boring, labor intensive part of quilting. But it must be done in order to get to the next stage of fun! I make my quilt sandwich differently than most of my friends, who look at me skeptically when I describe what I do. But it works for me, so I thought I’d share it with anyone who might be interested. 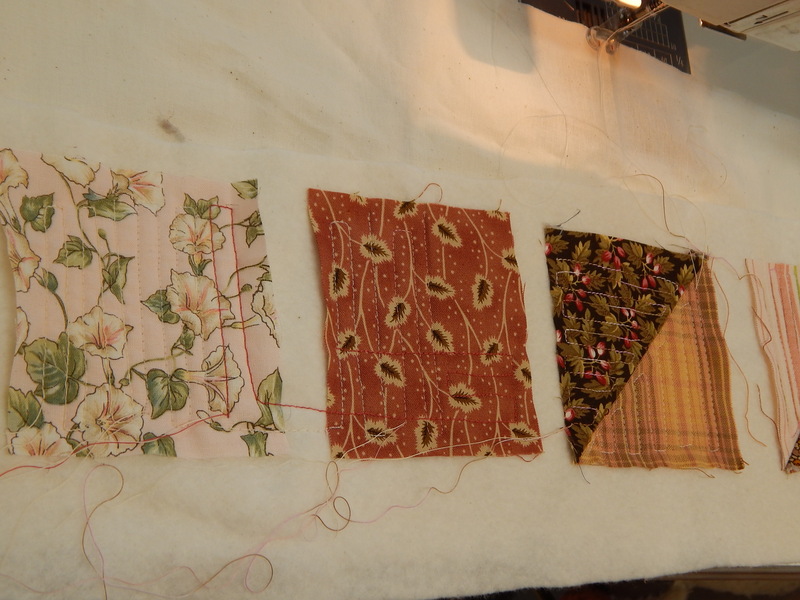 Originally I learned this in a workshop from Judy Dains, who uses it to make small (like 36″ square or less) wall quilts. But due to lack of space, or maybe laziness, I have been successful making my large (70″ x 80″) quilt sandwiches this same way. I make them on the ironing board. So you need to have good quality cotton batting. My most favorite batting is Quilter’s Dream Request. This is not available locally, so once in a while I will order it from Hancock’s of Paducah, especially when they are having a sale and free shipping. Otherwise, I like Warm and White, which is usually available at Joanne’s and I wait until it is on sale there too. You can use an 80/20 blend, like Hobbs, but it doesn’t work quite as well. And basically you steam the three layers together. 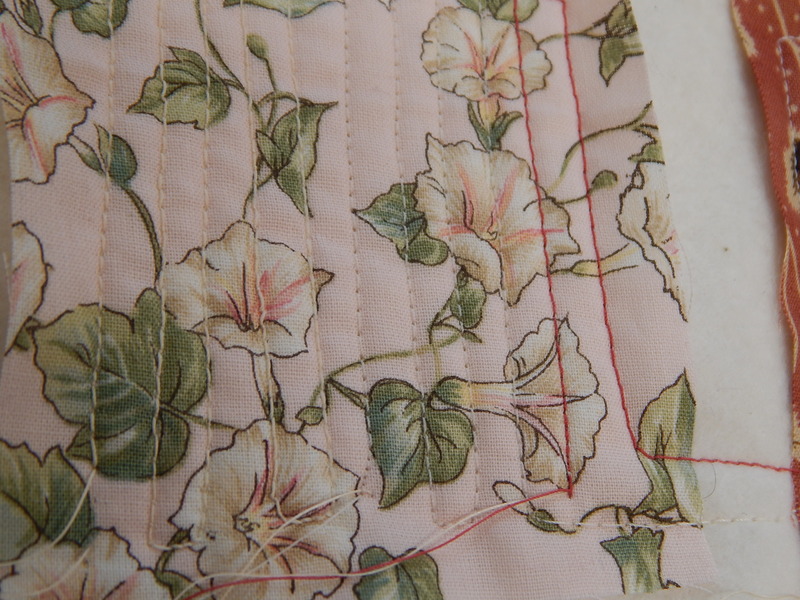 Then I take my long plastic ruler and slide it underneath the sandwich, between the quilt backing and the ironing board, so I can put some pins in place. But I only put the pins about every 15 inches or so. The steam does most of the work making the three layers stick together. The hardest part is carefully moving the sandwich to the next portion that needs to be steamed. If the quilt is smaller than your ironing board, it is no big deal. But if it is larger, as both quilts were that I did recently, you have to be careful that none of the layers wrinkle as you move them. If the quilt is large, I just do one half and then carefully flip and do the other half. The sandwich is quite stable this way. 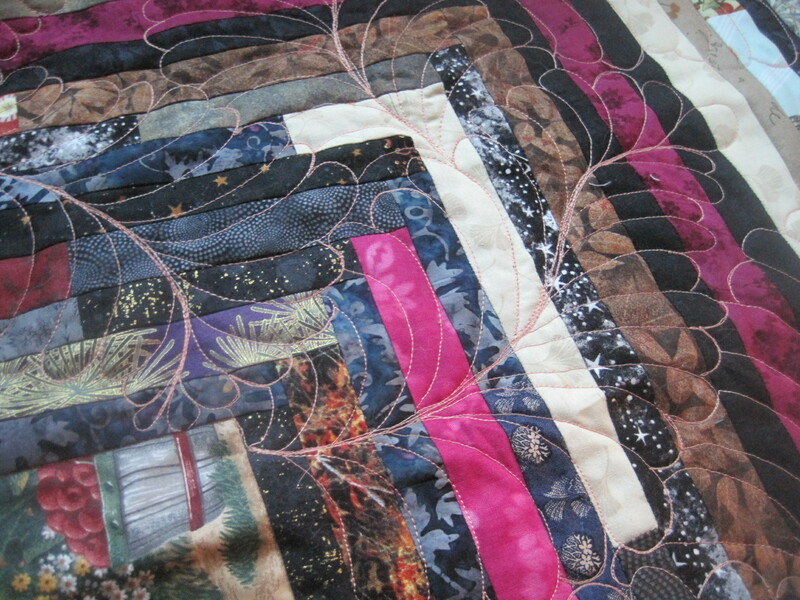 I like to take it to the machine and either machine baste it or if possible, stabilize it by quilting along the blocks. I use either the walking foot or sometimes the darning foot (free motion) for this part. That stabilized the whole center of the quilt, so I just machine basted the edge. I turn my machine speed down to the slowest speed for machine basting. And now all the pins are removed, and you have a completely stable quilt sandwich ready to go any time the mood strikes. My backs are just as smooth as any other quilt backs, and there is no bending over or crawling around on the ground. And no pesky pins getting in the way either. I made this quilt for machine quilting because of all the pointy spikes, and I made myself another one for hand quilting in the evening. BTW, that little star is Gwen Marston’s liberated star. 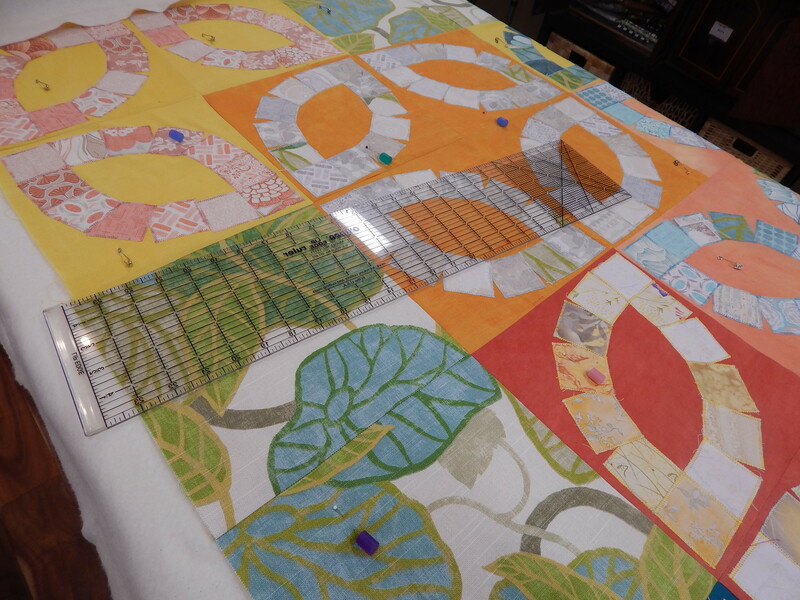 I just took this picture to show that when you are machine quilting, it is best to have as much of the quilt top supported on the table, and to keep the area that you are working on nice and flat and smooth. I love having this ‘industrial’ table that my machine sets into. I am pretty new at making feathers, but I am enjoying putting them here, there, and everywhere. I took this really close-up shot so you can see this method of making feathers. My BFF showed me how to do this. Basically you make one loop, and then backtrack along it PARTWAY, and then do the next loop. Make another loop, backtrack along it partway and make the next loop. This probably isn’t clear. But try drawing it with a pen. It is a nice little rhythm, and I think its a little easier than traditional feathers. 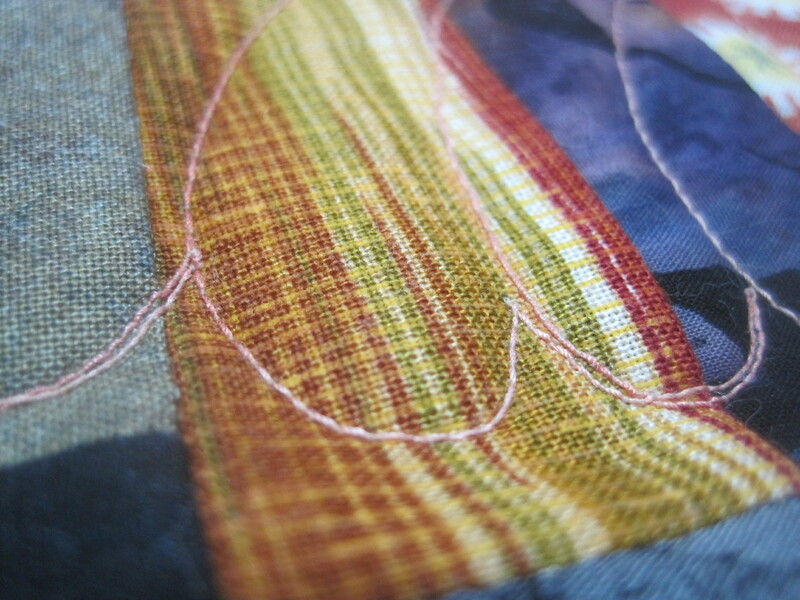 Well, this is the first entry on my quilting blog. 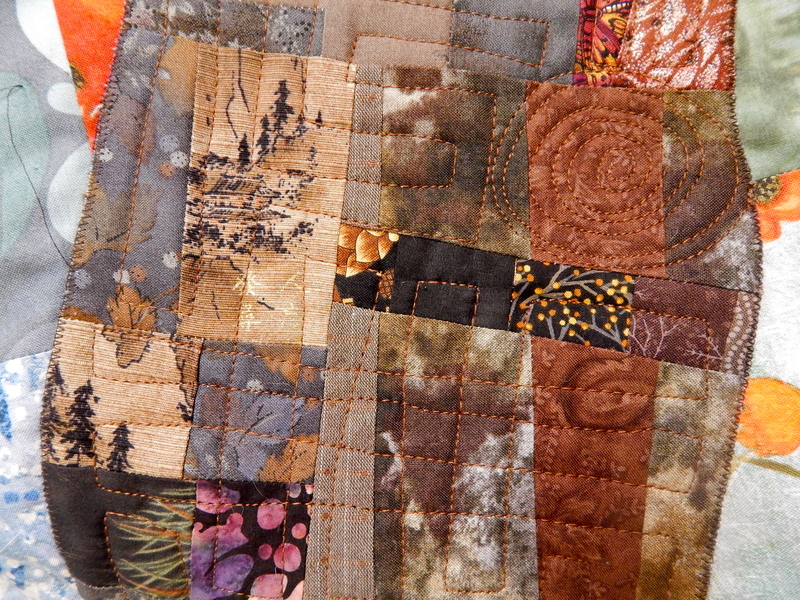 Don’t know if there’s a need for another quilting blog out there. But I’ve got a lot to say, and I like taking pictures, and I love quilting, so I’ll probably be back! Don’t know how much technical advice I’ll be offering though. Its kind of hard to figure out how to describe how to do something technical!